Neither sonata rigour nor Beethovenian elementals (cf. Alkan’s 1857 piano Symphony) underwrite the Fourth. Affirming, like its companions, Widor’s early Saint-Sulpice aesthetic, it asserts, rather, the idea of a homo-polyphonic partita-suite, identifiably Baroque in reference (cf. Raff’s piano Suites, 1857–76). Preceding the composer’s full assimilation of Liszt and Wagner (he attended the inaugural Bayreuth Ring in 1876), the harmonic language (unlike some of the key changes) is relatively straightforward, sometimes even plainly simple. That, however, Widor was a natural master of ‘fifth species’ counterpoint, passing note routines, sequence, and fugal procedure is never to be doubted. With practised ease, he weaves shapely lines and malleable textures, crafting his voices and articulation with an orchestrator’s eye. Franck’s view of the organ as an orchestra was one he shared—‘an organ of 30, 40, 50 stops is a [wind] orchestra of 30, 40, 50 musicians’. The minore first movement is a single-dotted-rhythm ‘French overture’ Toccata with florid interjections characteristic of the type. The second, also in the minor, is a four-part Fugue in 6/8 on a subject related to the gigue from Bach’s Third English Suite. Mendelssohn shadows the third and fourth chapters—a winning ‘song without words’ in A flat major, redolent of that master’s Op 19 No 4, played at Widor’s funeral (absent from the first edition); and (likewise added only in 1887) a nimbly semiquavered Scherzo in C minor (pianissimo staccato) with a common-time trio (in accompanied two-part canonic/imitative counterpoint) which serves also as a coda. The fifth movement, again in A flat, is stylistically a pastorale—on the one hand memorable for its voix humaines emphases and variations of detail (for instance, the harmonic enrichment and added pedal notes of the reprise); on the other striking for the key swings of the central section. The coda, at the end echoing of the close of the third movement, could not be more beautifully placed or proportioned. The maggiore Finale is a sonata-rondo on a 3/4 quasi-’martial’ refrain alla Schumann. Primary and secondary harmonisation contrasts with unexpected tonal event in the reprise following the triplefied D minor middle episode, the modified refrain reinforcing B flat and D flat rather than the tonic of expected convention. When F major is finally reached, it’s thundered home in appropriately ringing glory, full organ ablaze. 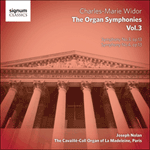 ‘Grandeur,’ Widor used tell his students, ‘is the organ’s essential characteristic. This is because, of all musical instruments, [it] can sustain sound indefinitely and with the same intensity’.